Conn, Heather. "Mary Greyeyes Reid". The Canadian Encyclopedia, 01 November 2018, Historica Canada. https://www.thecanadianencyclopedia.ca/en/article/mary-greyeyes. Accessed 25 April 2019. Mary Greyeyes, a Cree woman from Muskeg Lake Reserve, served in the Canadian Women's Army Corps in Canada and Britain, 29 September 1942. Mary Greyeyes was born in 1920 on the Muskeg Lake Cree Nation reserve north of Saskatoon, Saskatchewan. (See also Cree.) She had four brothers and six sisters. At age five, she attended St. Michael’s residential school in Duck Lake, Saskatchewan. After grade eight, Greyeyes took lessons from a nun at night. By day, she cooked, cleaned, sewed and did laundry for the school. After her brother David enlisted in the military, Greyeyes decided to join too. She travelled to Regina in June 1942 to enlist. The Canadian armed forces started recruiting women in 1941. Required to write a test, Greyeyes felt nervous due to her limited education, but she passed. At age 20, she became the first Indigenous woman to join the nation’s armed forces as a member of the Canadian Women’s Army Corps. However, Greyeyes was eventually transferred to London, England, where she cooked at the war headquarters. Her superiors, who wanted to provide the appearance of a pro-diversity workplace, brought Greyeyes to public events. It was then that she met Princess (later Queen) Elizabeth II, the Queen Mother and King George VI. Photos of her with public figures appeared in London newspapers. Greyeyes stayed in London until 1946. In September that year, the Canadian government disbanded the Canadian Women’s Army Corps, considering women’s service in peacetime unnecessary. Discharged, Greyeyes returned to Muskeg Lake, later calling her wartime years the best of her life. In late June 1942, Greyeyes’s sergeant and two Royal Canadian Mounted Police (RCMP) officers asked her to pose for a photo that would be used to encourage more women to enlist. They offered her a new uniform and hearty lunch in return. The RCMP paid Harry Ball, a First World War veteran and band councillor for the Piapot First Nation reserve northeast of Regina, $20 to participate in the same photo opportunity. He posed as a chief (though he did not become one until later), wearing a feathered headdress and blanket with borrowed accessories, including a pipe. The resulting photograph showed Greyeyes kneeling, in uniform, before Ball. For many years, the image, first published in the Regina Leader-Post, bore the caption: “Unidentified Indian princess getting blessing from her chief and father to go fight in the war.” The photo was distributed across Canada and the British Empire. After returning to Muskeg Lake in 1946, Greyeyes spent time with family. She later moved to Winnipeg, Manitoba, where she met her future husband, Alexander Reid. They moved to Victoria, British Columbia and raised two children, Stephen and Stephanie. Greyeyes, then also known as Mary Reid, worked for a time as a restaurant cook in Victoria. The family moved to Vancouver, likely in 1960, where Greyeyes worked as an industrial seamstress downtown. Mary Greyeyes Reid made history as the first Indigenous woman to join the Canadian army. In a widely circulated wartime photograph, she symbolized the military’s attempts to recruit women and Indigenous peoples in Canada. Grace Poulin, “Invisible Women: Aboriginal Servicewomen in Canada’s Second World War Military,” in Aboriginal Peoples and the Canadian Military: Historical Perspectives, edited by P. Whitney Lackenbauer and Craig Leslie Mantle (2007). ARTICLE DE QUOTIDIEN « What Does This Photo Say? 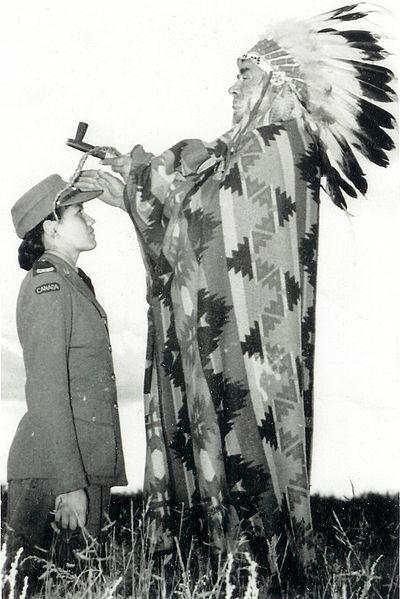 » cet article de 2012, publié dans The Tyee et rédigé par Melanie Fahlman Reid, la bru de Mary Greyeyes Reid, propose un point de vue personnel sur la photo de propagande militaire dans laquelle apparaît Mary Greyeyes en 1942. NATIONAL FILM BOARD Watch an interview with Mary Greyeyes Reid and other Indigenous veterans and their families in the National Film Board movie, Forgotten Warriors: The Story of Canada’s Aboriginal War Veterans, directed by Loretta Todd, 51 minutes, 1996. NEWSPAPER ARTICLE “What Does This Photo Say?”: This 2012 article, published in The Tyee and written by Melanie Fahlman Reid, Mary Greyeyes Reid’s daughter-in-law, provides a personal perspective on the military propaganda photo in which Greyeyes appeared in 1942.